We’d love your help. 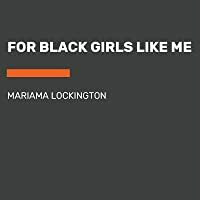 Let us know what’s wrong with this preview of For Black Girls Like Me by Mariama J. Lockington. Makeda June Kirkland is eleven years old, adopted, and black. Her parents and big sister are white, and even though she loves her family very much, Makeda often feels left out. When Makeda's family moves from Maryland to New Mexico, she leaves behind her best friend, Lena―the only other adopted black girl she knows―for I am a girl but most days I feel like a question mark. Makeda June Kirkland is eleven years old, adopted, and black. Her parents and big sister are white, and even though she loves her family very much, Makeda often feels left out. When Makeda's family moves from Maryland to New Mexico, she leaves behind her best friend, Lena―the only other adopted black girl she knows―for a new life. In New Mexico, everything is different. At home, Makeda’s sister is too cool to hang out with her anymore and at school, she can’t seem to find one real friend. To ask other readers questions about For Black Girls Like Me, please sign up. Thanks to author Mariama J. Lockington (@forblackgirlslikeme) and @macmillankidsbooks for a free copy of this STUNNING book to share with @kidlitexchange. I will be mailing this to @akossket right away and then it will be shared w/#kidlitexchange. This book isn't out until July 30, but please put it on all your summer pre-orders now. It's perfect for grades 4 - 8 and belongs in each and every elementary and middle school library in America. 5/5 big GUSHING stars for this beautifully written de Thanks to author Mariama J. Lockington (@forblackgirlslikeme) and @macmillankidsbooks for a free copy of this STUNNING book to share with @kidlitexchange. I will be mailing this to @akossket right away and then it will be shared w/#kidlitexchange. This book isn't out until July 30, but please put it on all your summer pre-orders now. It's perfect for grades 4 - 8 and belongs in each and every elementary and middle school library in America. 5/5 big GUSHING stars for this beautifully written debut novel. Written in prose, but also poetry, lyrics, letters and Tumblr posts, For Black Girls Like Me tells the story of Keda, a young Black adoptee who is struggling with her identity while also dealing with her mother's worsening mental illness. Short chapters, a compelling narrative and well developed characters make this a quick, compulsive read. I know several students who will devour this book in one or two sittings like I did. And YET -- while this was a quick read, the message and story will be with me for a long time. Keda's family has moved from Baltimore to Albuquerque for her father's job. Her parents are both accomplished string musicians, but her mother is out of work for now and spends long days in bed. Her white sister, Eve, immediately finds new friends in her new school, but the transition is not as easy for Keda. In her new school, Keda experiences both microaggressions and overt racism (including the N word). When she finds out, her mother tries to help by dramatically removing both daughters from the school. While this may be the correct response, the mother's drama and white tears, her constant insistence on being "colorblind" when Keda knows the world is anything but and her refusal to buy her daughter effective lotion for her skin all add up to a mother who doesn't truly understand her own child. Keda feels like she doesn't have anyone to turn to for help besides her best friend (and fellow adoptee), Lena, who is now on the other side of the country. Keda and Lena's letters radiate with warmth, humor and love; they are my very favorite part of this book. Their resulting Tumblr, titled Questions I Have For Black Girls Like Me, is an outlet for Keda and her emotions. As Keda's mother's illness worsens and her behavior becomes more erratic, Keda and her sister Eve must work through their differences to support each other and help their mother. Readers will likely appreciate the complicated end of this book; many of the characters have work to do in the future if they are to support each other effectively. No neat happy endings here. For Black Girls Like Me is a perfect #windowsandmirrors book that offers important insight into the world of a transracial adoption, as well as the reality of living with a mentally ill parent. I can't wait to send it off to #kidlitexchange to get more reviews, especially from some Black reviewers. A heartbreaking, beautiful book about family, identity, and the messiness of being a human. The story follows Makeda (Keda for short) through a move across the country with her family. While her older sister is outgrowing childhood and leaving Keda behind, Keda wrestles with being all alone in a new school where she experiences microaggressions and overt racism. To add to the loneliness, her father is busy with a new job, and her mother is slipping into a depression. Keda was adopted as a baby, a A heartbreaking, beautiful book about family, identity, and the messiness of being a human. The story follows Makeda (Keda for short) through a move across the country with her family. While her older sister is outgrowing childhood and leaving Keda behind, Keda wrestles with being all alone in a new school where she experiences microaggressions and overt racism. To add to the loneliness, her father is busy with a new job, and her mother is slipping into a depression. Keda was adopted as a baby, and none of Keda's white family members understand her needs, from buying the right lotion for her skin to taking her to the right hair salon to saying the world should be "colorblind", they don't get it right. Keda yearns to understand what it would be like to grow up in a biological family. This book is beautiful, beautiful, beautiful. I finished it with tears in my eyes and hope in my heart. Lockington's writing is gorgeous. There were so many moments of beautiful imagery. Countless lines I stopped to read twice. The poetry in the book is lovely, and the letters between Keda and her best friend were one of my favorite parts. They were vibrant with humor and truth and a love you could feel. Keda's voice sings through these pages. It drew me in from the first line and wrapped me up This book is beautiful, beautiful, beautiful. I finished it with tears in my eyes and hope in my heart. Wide-range of tough topics. Realistic characters who make mistakes and are human. Then, they grow. Finally, Keda. I loved her so much. I received this book as part of the #LitReviewCrew in exchange for an honest review. This is a really special, beautiful middle grade book that touches on so many things young adoptees face across racial lines, mental health & the delicate beauty of becoming a young woman when you are a sweet little girl with an old soul. The cover is exquisite and it absolutely conveys the wonder and amazement that awaits readers inside the book. This book is beautiful in so many ways. I love the style, I love Keda, and I love her story. I cannot wait to tell my students all about it! Beautifully written coming-of-age story about Keda, an adopted black girl being raised by white parents. After moving to a new place, Keda needs to navigate a new school, new friends, and her mother's worsening mental illness. Gorgeous writing and compelling characters! 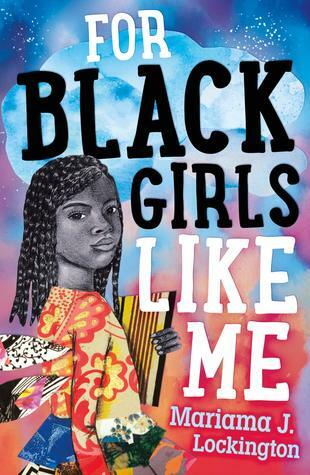 Both beautiful and compelling, FOR BLACK GIRLS LIKE ME is from the perspective of Keda, a black girl who was adopted as an infant into a white family. You will be rooting for Keda from page 1 as she navigates a cross-country move and struggles to find where she belongs. Family and friendship relationships are nuanced and multi-layered. The writing is lyrical and perfectly crafted. A must-read. The writing is very good and the details of Makeda’s thoughts and feelings are incredibly perceptive and well-expressed. It’s important to remember that the book is completely focused on Makeda — her perceptions, her memories, her hopes, and her experiences from her perspective. As an older white person (not the target demographic here), I cringed at the description of her mother — the absolute stereotype of a guilt-ridden white liberal. When it becomes clear that her mother is mentally ill — she is diagnosed with bipolar disorder later in the book — her whiteness and mental illness kind of blend together. Makeda’s experiences at her new school and a girl scout troop were also blatantly racist, without any compensating non-racist encounters which I found disappointing. Keda is a Black eleven-year-old girl with a white adoptive family. When her family moves to a different state Keda gets separated from her best friend, the only other Black girl with a white adoptive family she knows. Now she has to dig deep (into her beliefs and emotions) to face the world with the type of ugliness only she experien @Kidlitexchange #partner - I received a copy of this book from the Kidlitexchange network in exchange for an honest review. All opinions are my own. Keda is a Black eleven-year-old girl with a white adoptive family. When her family moves to a different state Keda gets separated from her best friend, the only other Black girl with a white adoptive family she knows. Now she has to dig deep (into her beliefs and emotions) to face the world with the type of ugliness only she experiences because of her skin color. There are so many Black girl truths in this book. I teared up, I laughed, I blushed, I hollered and got angry right along with Keda. Keda's story of coming of age is also one of family emotional ties. The love and patience she has for her family (especially her mom) will make your heart swell. The way the author handles mental illness squeezed my heart. She does it truthfully with the confusion, anger, denial and loss that usually follows a medical diagnosis. Keda's life sounds rough and emotionally draining but I appreciate the relentless presence of hope in the story through Keda's beautiful verses. Things are very messy but definitely not hopeless. This is a book that is sure to spark hours and hours of discussions. I can't wait for July so I can finally talk spoilers with quotes because I. Have. Things. To. Say. This is a stunning and brilliant debut novel about family, race, mental health, and the often painful process of becoming yourself. Makeda—sensitive and intuitive, creative and hope-filled, adolescent-awkward and so strong—is written with such honesty and complexity. And the writing—told in lyrical prose, in song, in poetry, in Tumblr posts and letters, I found line after line that I wanted to repeat out loud, wanted to remember. Readers will feel seen and inspired by this moving and truth-fille This is a stunning and brilliant debut novel about family, race, mental health, and the often painful process of becoming yourself. Makeda—sensitive and intuitive, creative and hope-filled, adolescent-awkward and so strong—is written with such honesty and complexity. And the writing—told in lyrical prose, in song, in poetry, in Tumblr posts and letters, I found line after line that I wanted to repeat out loud, wanted to remember. Readers will feel seen and inspired by this moving and truth-filled story that I will be recommending again and again. Mariama J. Lockington’s stunning debut is the kind of book you’ll lose track of time reading! Set in the simultaneously bright and harsh high desert, this story features poetic language that highlights main character Keda’s heartbreaking strength. I was deeply inspired by the resilience and sense of self she fosters through difficulties at home and beyond. I love, love, loved this story and it’s poetic elements. I feel Keda, her sense of who am I in this world, and being a black girl (often the only black girl) in certain situations. Keda girl, Keda girl- we got you.